Our Story and a Dog: We’ve been partnering with companies like yours in San Diego for thirty years. We’re experts in turning office break room spaces into retreats where employees come to refresh and recharge. Our wide range of services feature the most requested brand-name snacks, beverages and treats to keep employees engaged and productive throughout the work day. Our team will create a custom break room services menu to delight your employees. And, we’ll regularly rotate in new products to keep your selection interesting and fresh. The dog… was created in 1984 by our founder Norm Leider…..His name is TriR. He’s a retro embodiment of the hardworking, dedicated spirit of man’s best canine friend. 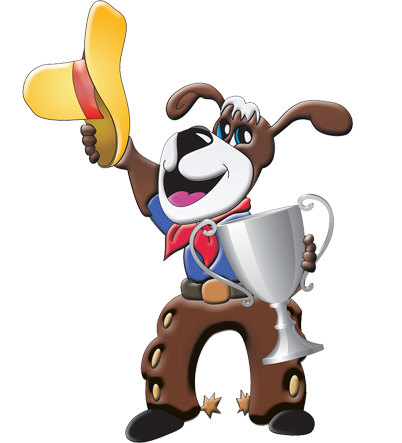 And because we’re in the west, he’s sporting his canine chaps and a shiny trophy. He’s strutting proud after winning the Vend Operator of the Year Award. He’s a bit old school yes, but our commitment to our customers still stands today. When you ring the breakfast, lunch, snack or dinner bell, we’ll come running. We value your opinion whether it’s a compliment or way to improve our service. Tri-R Coffee & Vending is a premier provider of vending, micro-market, and office coffee service in San Diego, CA. To get there we partnered with our customers, listened to their feedback and improved our service until it was the best. If we are doing a great job at your location, we would love to hear it. If there is room for improvement, don’t hesitate to suggest a better way or share your experience. We will review all comments in order to better service our customers. Please take our short survey below. We'll bring the healthy snacks! Sorrento Valley, DelMar, Otay, Downtown San Diego, El Cajon, San Ysidro.